The Westgate Resort Foundation recently celebrated its 15th anniversary and announced a contribution of $1 million in grants to benefit regional nonprofit organizations in Central Florida during their Grantee Celebration Breakfast. Orange County Mayor Teresa Jacobs attended the celebratory breakfast and delivered welcome remarks. The Foundation for Orange County Public Schools received a $15,000 grant from the Westgate Resorts Foundation. Heart of Florida United Way, Victim Service Center of Central Florida, Goodwill Industries of Central Florida, A Gift for Teaching, Harbor House, IDignity, City Year Orlando and United Against Poverty were also among the local nonprofits who benefited from Westgate Resorts Foundation’s generous grants. In addition to the nearly $1 million dollars donated to several nonprofit organizations throughout Central Florida, Westgate Resorts and its Foundation were a beacon of light in the wake of the Pulse Nightclub tragedy. Westgate Resorts honored the many first responders who served during the tragedy, provided lodging for families of victims and survivors and offered employment to displaced Pulse workers. Additionally, Westgate Resorts, in conjunction with its Foundation and the Orlando Predators, donated a total of $50,000 to the One Orlando Fund. The Westgate Resorts Foundation strives to build strong families and a strong workforce by focusing its efforts on family and youth homelessness, domestic violence, education and veteran employment, which aligns with many of Mayor Jacobs’ initiatives. The CEO and founder of Westgate Resorts, David Siegel, has also joined Mayor Jacobs in fighting America’s heroin epidemic on a local, state and national level and served as a guest speaker for the Orange County Heroin Task Force. In keeping with the event theme of “strength through collaboration,” Westgate’s leadership challenged organizations to build relationships and encouraged collaboration and problem-solving with one another. 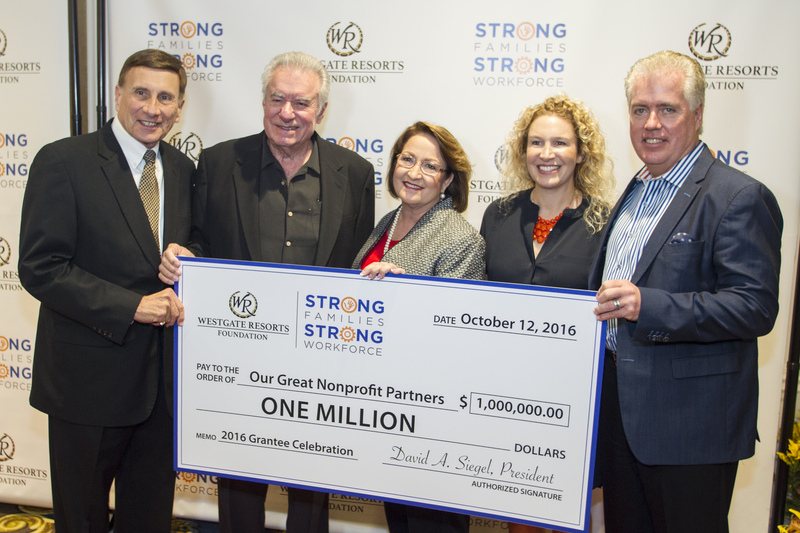 The Westgate Resorts Foundation will offer a series of challenge grants this year to existing grantees that collaborate in groups of two or more to innovatively tackle issues within the Foundation’s focus areas. Westgate Resorts also continues to add growth to Central Florida’s economic sector. The company will invest a record $61.7 million between 2016 and 2017 into its 13 area resorts, creating nearly 1,500 construction jobs and long-term employment opportunities. To view photos from the Grantee Celebration Breakfast, visit Mayor Jacobs’ Flickr album.